Four of the biggest vMVPDs have raised their prices 10% or more this year. The high price increases show that vMVPDs haven’t fixed what ails pay TV. All they can do is smooth the transition to what comes next. In the past couple of weeks, three of the top vMVPDs have announced $5 price increases. Sling TV moved first, increasing its entry-level “Orange” tier, which brings around 30 channels and a single stream, from $20 to $25 a month (25% increase.) Next, AT&T announced it would add $5 a month to all its packages. The entry package increases from $35 a month to $40, a 14% increase. Finally, Sony said that the two PlayStation Vue packages would increase $5-a-month to $44.99 (up 12%) and $84.99 (up 6%.) Earlier in the year, YouTube TV increased its bundle cost by $5-a-month to $40. Unfortunately, price increases are inevitable for vMVPDs. As well, the size of the increases is liable to be higher, as a percentage, than increases we typically see from pay TV. The largest cost faced by any MVPD, traditional or virtual, is for the content that is delivered by the service. nScreenMedia estimates that YouTube TV, even after increasing prices, is still barely able to pay the content license fees it faces. Add in the streaming costs, marketing, and other operational costs and the service is almost certainly making a loss. Traditional pay TV operators also face the same costs. For example, for every dollar Comcast receives in revenue for its cable TV service, it must pay 59 cents to the content providers. Moreover, content costs are increasing faster than pay TV operators can raise prices. 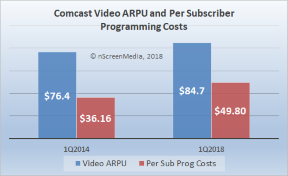 Comcast has seen content costs increase 38% since 2014 but has only seen ARPU (average revenue per subscriber/unit) increase 11%. Pay TV operators have been able to absorb some of the huge increase in content costs because they have more profit margin than vMVPDs. As well, they can offset the increases against other related services, like broadband. Wireless providers are willing to do the same with some of their video services. For example, AT&T is launching a new vMVPD service called Watch which will be free for some high-paying wireless customers. However, most vMVPDs have no margin to speak of and simply can’t absorb the massive increases demanded by content providers. They will be forced to pass the increases directly along to customers. Though vMVPDs solve an immediate problem for consumers, the high price of pay TV services, they do not solve the fundamental problem with the industry. They strip out many of the costs in the business, and that allows them to charge less than traditional pay TV. However, one cost they can’t remove is the largest, the content. Moreover, that is where the real problem lies. Simply put, content providers want more for their content than consumers are willing to pay. They are shielded from the real market value of their TV channels because they are rolled up into a big bundle. This model has led to huge disconnects in the value of the content to consumers, and the amount content providers receive. For example, how many pay TV subscribers would be willing to pay $8+ a month for ESPN, as they do today as part of the big bundle? In its Q4 2017 Video Trends Report, TiVo asked consumers which channels they would like in their ideal bundle and how much they would pay. 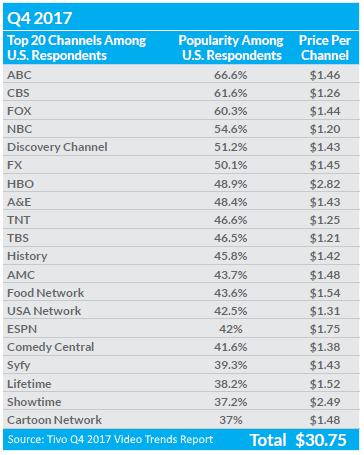 42% of the survey group picked ESPN but said they would be willing to pay just $1.75 a month. Let the unbundling of television begin! vMVPDs have begun to pass along the large increases in programmer fees they face to consumers. Content fees are the reason pay TV has become so expensive and vMVPDs suffer the same problem. There is no solution to the escalating cost of TV of the big bundle. 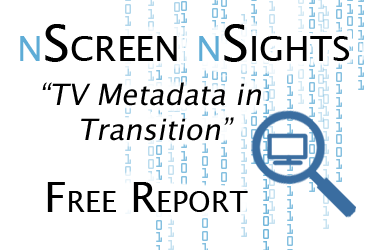 vMVPDs can only help to cut the costs of pay TV in the short-term and smooth the transition to what comes next.